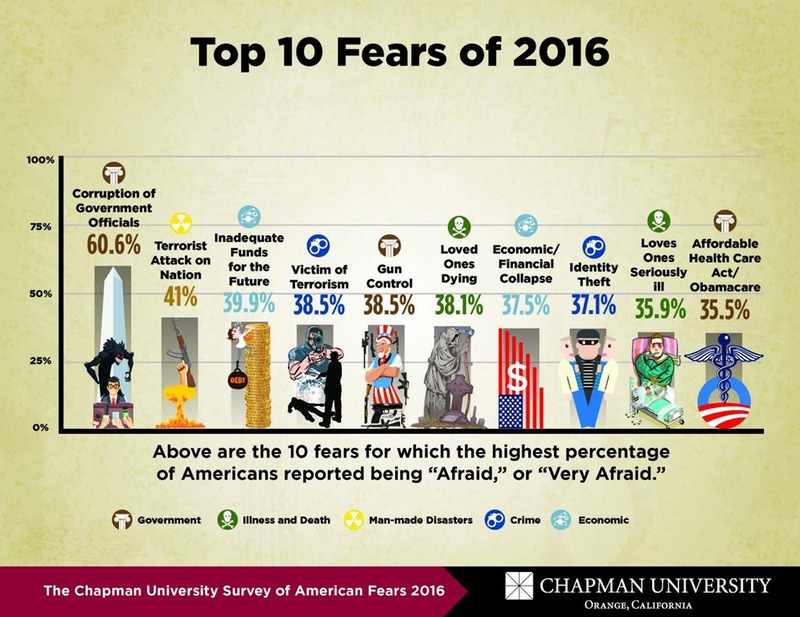 IMAGE: Chapman University Survey of American Fears 2016 is shown. Chapman University recently completed its third annual Chapman University Survey of American Fears (2016). The survey asked respondents about 65 fears across a broad range of categories including fears about the government, crime, the environment, the future, technology, health, natural disasters, as well as fears of public speaking, spiders, heights, ghosts and many other personal anxieties. In its third year, the annual Chapman University Survey of American Fears included more than 1,500 adult participants from across the nation and all walks of life. The 2016 survey data is organized into five basic categories: personal fears, conspiracy theories, terrorism, natural disasters, paranormal fears, and fear of Muslims. Beliefs in conspiracy theories were a new element to the 2016 survey and included questions asking about levels of belief in nine different popular conspiracies and conspiracy theories, such as the JFK assassination, Barack Obama’s birth certificate, alien encounters, the moon landing, the 9/11 attacks, the AIDs virus and more. What they learned is more than half of all Americans believe the government is concealing information about the 9/11 attacks; as well as the assassination of John F. Kennedy. Another 40 percent believe the government is hiding information about extra-terrestrials and global warming; and one-third believe there are conspiracies surrounding Obama’s birth certificate and the origin of the AIDs virus. Nearly one-fourth of Americans also believe there is something suspicious about the death of Supreme Court Justice Antonin Scalia. “We found clear evidence that the United States is a strongly conspiratorial society,” said Dr. Bader. “We see a degree of paranoia in the responses. Most indicative is nearly one-third of respondents believed the government is concealing information about ‘the North Dakota crash,’ a theory we asked about that – to our knowledge – we made up,” Dr. Bader continued. According to the demographics gathered in the survey, the most likely person to believe in a conspiracy theory is a Republican who is employed, but has a lower level of income and education. He or she is likely to be Catholic – or a Christian denomination – but attend religious services infrequently. “Conspiracy theorists tend to be more pessimistic about the near future, fearful of government, less trusting of other people in their lives and more likely to engage in actions due to their fears, such as purchasing a gun,” added Dr. Bader. Due to the increase in domestic terror attacks, such as in Orlando and San Bernardino, as well as abroad, the researchers added specific language to explore Americans’ fears related to terrorism. In the top 10 fears cited in the survey overall, “terrorist attack” ranks second, with 41 percent of Americans being afraid of a terror attack–and more than 60 percent believing the United States is likely to experience a large scale terrorist event (such as 9/11) in the near future. “These attacks have added urgency to the need for the public to understand the precursors of terrorism,” said Ann Gordon, Ph.D., associate dean of the Wilkinson College of Humanities and Social Sciences at Chapman University and one of the three researchers on the study. “Following the San Bernardino attacks, President Obama reminded Americans that if they ‘see something, say something.” The researchers found that most Americans want to be vigilant, but they are unaware of what kinds of behaviors constitute precursors to terrorism. Interestingly, there are clear partisan differences in views on the government’s handling of terrorism with Democrats being more likely to believe government has done a good job compared with either Republicans or Independents. Additionally, the survey asked respondents if they have rethought everyday activities due to fear of terrorism. Half of Americans fear traveling abroad; one-fifth reported they are less likely to attend a concert, sporting or other public event; and three-fourths are more willing to accept longer lines and security screenings at airports. More than half of all Americans (63 percent) believe that “natural disasters in my area are capable of doing serious harm to me or my property.” And, the vast majority (78 percent) believes an emergency kit would improve their chances of surviving a disaster. Nevertheless, 74 percent have made no effort to put together such a kit. “We found that each of these attitudes contributed significantly to the likelihood of preparing for disaster with an emergency kit and a plan,” said Dr. Gordon. “When communicating with the public about the importance of disaster preparedness, it is vital that the message emphasize these four beliefs. Without these components, the message is likely to cause fear without action,” Dr. Gordon continued. The Chapman University 2016 Survey of American Fears included a series of items on paranormal beliefs ranging from Bigfoot and psychic powers to haunted houses and extraterrestrial visitation. Currently, the most common paranormal belief in the United States is the belief that places can be haunted by spirits with nearly half of Americans believing this. Roughly one percent of the U.S. adult population are Muslims. The 2016 Chapman University Survey of American Fears explored how Americans as a whole view this small subgroup. The results show that a large proportion of the adult American population distrusts Muslims and believes extra security should be employed against them. The survey further examined how Muslims are viewed relative to other segments of society based on trust–only “strangers” were more distrusted than Muslims. When it comes to feelings about and treatment of Muslims, nearly half of Americans reported that they would not be comfortable with a Mosque being built in their neighborhood; one-third reported that Muslims are more likely to engage in terrorism, as well as agree that the U.S. should halt all immigration from Muslim nations. “For a nation that touts its commitment to religious liberty, the prevalence of these beliefs should be disturbing,” said Ed Day, Ph.D., chair of the department of sociology at Chapman University and one of the three researchers on this survey. In examining beliefs about Muslims from different regions of the country there was a striking finding–the difference between people living in metropolitan areas and nonmetropolitan Americans. Urban residents are much less likely to distrust Muslims or support institutionalized discrimination. When it comes to gender, the survey showed that men are more likely than women to hold anti-Muslim opinions. And, when compared with the rest of the ethnic groups in the American population, whites showed significantly higher levels of Islamophobia than non-whites. Finally, there is a strong relationship between political party affiliation and anti-Muslim views–Republicans expressed the highest levels and Democrats the lowest, with independents in the middle. The survey was a random sample of 1,511 Americans who are English speaking and over the age of 18. The survey was administered by GFK (Knowledge Networks) a consumer research company with expertise in probability samples. Data were collected between May 5, 2016, and May 18, 2016. The survey took, on average, 20 to 25 minutes to complete. The sample of the Chapman University Survey of American Fears mirrors the demographic characteristics of the U.S. Census. A comprehensive list of the all the fears from The Chapman Survey on American Fears 2016 can be found http://www.chapman.edu/fearsurvey. In addition to Bader, Day and Gordon, student involvement was key in helping throughout the process. As an academically distinguished center of learning, Chapman University attracts extraordinary students and faculty from around the globe. Its ten schools and colleges foster a vibrant intellectual community, and provide extensive opportunities for students to learn, grow and discover alongside remarkable faculty. The University is home to some 8,000 students pursuing bachelor, master and doctoral degrees, and is alma mater to more than 40,000 alumni found throughout the United States and the world. Now celebrating its 155th year, Chapman is known for its distinguishing strengths in leadership and civic engagement, in the arts and entertainment disciplines, and in specialized sectors of technology and science. The University is comprised of its main campus in Orange, California, and the Rinker Health Science campus for graduate health science programs in Irvine, California. Visit us at http://www.chapman.edu. October 14, 2016 in Societal. Reblogged this on vara bungas.